You want more distance on your Tee-shots? Why not get more distance with all the clubs in your bag? For most golfers, I watch play the game, there is a quick route to adding at least 15 yards to Tee-shots or adding another 7 – 10 yards to their Iron shots. Too many golfers actually strike the golf ball a glancing blow with only a partial release of the club through the impact zone. Quite obviously the “glancing blow” is going to have the effect of reducing the amount of energy transferred to the ball to send it down the target line. However, the glancing blow is almost always a symptom of a larger problem. The golfer has got “outside” the line at the start of the downswing and now needs to steer their hands through the downswing, to try and get the club face square to target. 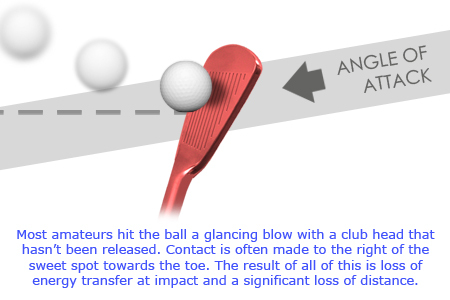 That means their hands are not releasing the club head properly through the impact zone, creating a large distance loss. creating a faster club head speed and therefore gain more distance. This entry was posted in golf, golf tips, sports and tagged golf slice, out to in golf swing. Bookmark the permalink.